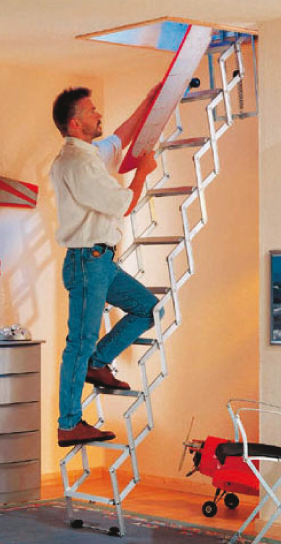 This Loft Ladder, comes fully assembled ready to fit openings 600mm long x 500mm wide or greater. The unit is fitted to the inside of the hatch by means of a wooden plate 450mm x 200mm, (see image). For floor to ceiling heights up to 2.45m, please select the 9 tread, for floor to ceiling heights up to 2.73m, select the 10 tread and for floor to ceiling heights up to 3.00m select the 11 tread. You should allow for a maximum vertical clearance of 500mm from ceiling below to highest point of ladder above. Their sprung controlled operation, keeps concertina ladders horizontal in the hatch when not in use. They are brought to the vertical position with the hook which is supplied, then extended to the floor and adjusted to suit your own position. Strong construction, with wide treads (80mm x 350mm). These loft ladders come with hinges, door catch and pole hook Max. safe loading of 100kg.